By Brandi Williams, LifeSmarts Program Assistant There is nothing better than seeing LifeSmarts in action! Not long ago, I had the opportunity to travel from the National Consumers League’s office in Washington, DC to attend the Florida state LifeSmarts competition in Tampa. As NCL staff prepares for the National LifeSmarts Championship in April, also to be held in the state of Florida, we are always excited when we have the chance to attend a state LifeSmarts competition and visit with our state partners. The Florida LifeSmarts program, coordinated by the Florida Department of Agriculture and Consumers Affairs, hosted its 2010 state competition at the Florida State Fairgrounds on President’s Day, February 15, 2010. On a day where many students were out of school for the 3-day holiday weekend, 13 student teams from all over the large state of Florida were in attendance to compete for the title of LifeSmarts State Champion and to represent Florida at Nationals. Teams traveled for five to six hours from far-away cities including Jacksonville and Freeport to showcase their dedication—to not just LifeSmarts, but also to consumer literacy—affirming their commitment to learning the necessary skills to be educated, savvy consumers in today’s changing marketplace. The rounds of competition were tough, culminating in a neck-and-neck battle between the reigning state champs, Seminole County 4-H team and Paxon SAS Varsity from the Paxon School for Advance Studies. 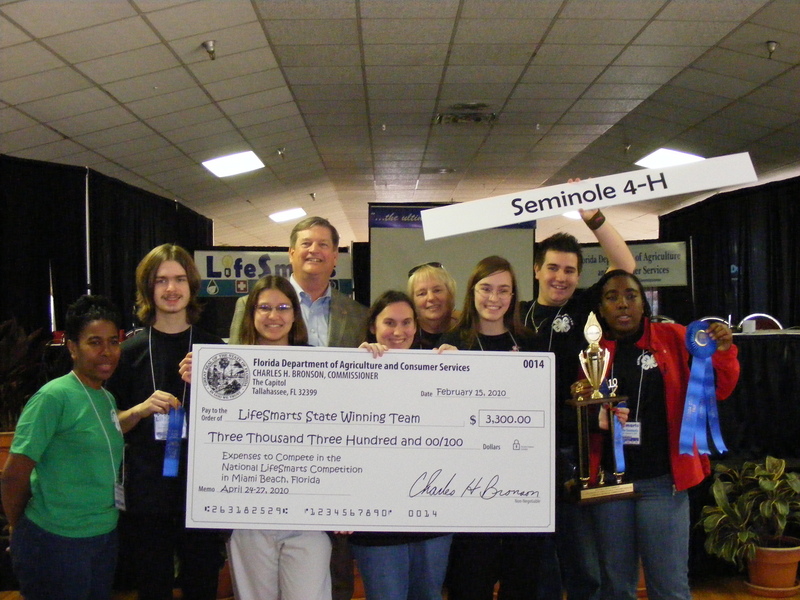 While the match was close, Seminole 4-H once again took the title will be on their way to Miami in April. [caption id="attachment_1019" align="alignleft" width="300" caption="Florida state champs declared in Tampa."] [/caption] Florida Department of Agriculture and Consumers Affairs Commissioner Charles H. Bronson was there to cheer teams on. He also gave remarks and congratulations to all 13 teams in attendance, and presented the winning team and coaches with a check for $3,300 on behalf of the Florida Department of Agriculture and Consumers Affairs. State Coordinator Gwen Worlds recalled how enthusiastic Commissioner Bronson was when he attended the 2008 LifeSmarts National Championship held in Orlando, FL. “He jumped up from his seat and cheered the Florida team on,” Worlds said. “It was encouraging to the Florida team.” Congratulations to all teams at the Florida LifeSmarts Competition, and the best of luck to Seminole 4-H in Miami Beach in April!